This was the week of no recipe meals. 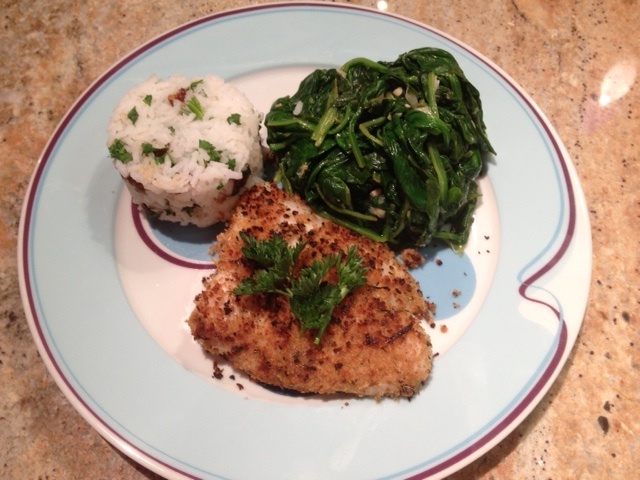 This one was with Swai fish, sauteed spinach and rice pilaf. Again, I had all the ingredients on hand. The Swai (about 4 ounces a person) was breaded with whole wheat panko that was flavored with a pinch of pepper, salt and garlic powder. It was "fried" a couple of minutes on each side in a cast iron skillet with olive oil cooking spray. I topped it with a sprig of parsley for appeal. That was it. The spinach which came pre-washed and trimmed was sauteed with about 1/2 cup of low sodium chicken broth and some freshly chopped garlic. Everyone was served 1 cup of the cooked spinach which took maybe 5 minutes to prepare. The rice was white rice because I wanted something to cook in 20 minutes or less. I used 1 cup of rice to 2 cups of water. Once it was cooked I added about 1/4 cup of chopped fresh parsley from our garden and 2 tablespoons of chopped dates. Everyone was srved 1/2 cup each. This was a super easy meal to prepare, was very flavorful, colorful and light on the calories. A similar meal I have prepared with recipes can be found with this link: http://livligahome.blogspot.com/2012/11/orange-glazed-salmon.html. The total for this meal was a mere 236 calories. It felt great to fix such a healthy meal without a recipe. We still measured out the servings and I made sure it was a balanced meal with protein, carbs and vegetables. Can't wait for the next no recipe test!